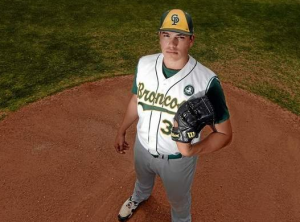 Pitcher Cody Ponce of Cal Poly Pomona is projected to have his name called on Day 1 of the 2015 Major League Baseball Draft. Ponce is projected by some to be a mid to late first round pick. During his last appearance on the mound for the Broncos, Ponce pitched seven innings against the University of Tampa with eight strikeouts during the first game of the NCAA Division II World Series. While he did allow three runs in the first inning, he would later go on to retire 11 consecutive batter. Stay tuned for more on Cody Ponce and other college baseball players from across the Inland Empire. This entry was posted in Cal Poly Pomona baseball, CCAA, CCAA Basketball Tournament, Cody Ponce and tagged Baseball, Cal Poly Pomona, Cody Ponce, Milwaukee Brewers, MLB, MLB Draft by James H. Williams. Bookmark the permalink.